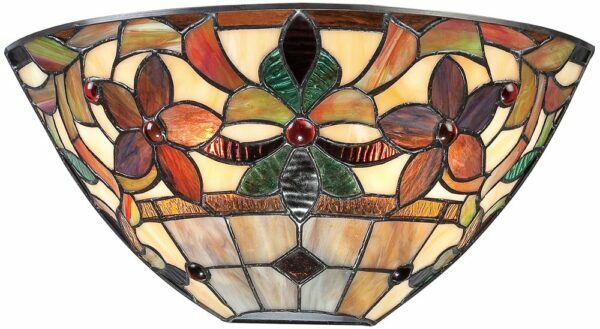 The Kami traditional floral 2 light Tiffany wall lamp, part of a stunning range featuring a floral design set in an Art Nouveau pattern, handmade using high quality art glass. Brought to you by Elstead Lighting and designed by Quoizel. A traditional Tiffany wall light, with a concealed wall bracket and floral shade. Most of the light will be directed upwards whilst the shade will be highlighted like a piece of wall art. The wonderful hand-crafted Tiffany shade contains 112 separate pieces of high quality art glass and features a scene depicting flowers, leaves and berries in shades of caramel, amber, emerald green and ginger. The flowers are set within a classic flowing Art Nouveau pattern. The range and warmth of colours ceates a harmonious balance of light, whilst the amber rippled glass highlights and jeweled berries will create contrast and spakle like jewels when illuminated. A hand-crafted wall mounted Tiffany uplighter lamp, soldered using traditional techniques that have been used for centuries. The shade colours may differ slightly from the image shown as each piece of glass is hand-made and may differ slightly in colour or shade. This should not be seen as a fault, rather something that makes each Tiffany shade unique. Part of the hand crafted Kami Tiffany lighting selection designed by Quoizel.